I have followed the steps required to create a new application and getting consumer key, secret pairs and also the token access details. Now I would like to make calls to Twitter Rest API, using chrome Postman client. "message": "Could not authenticate you." 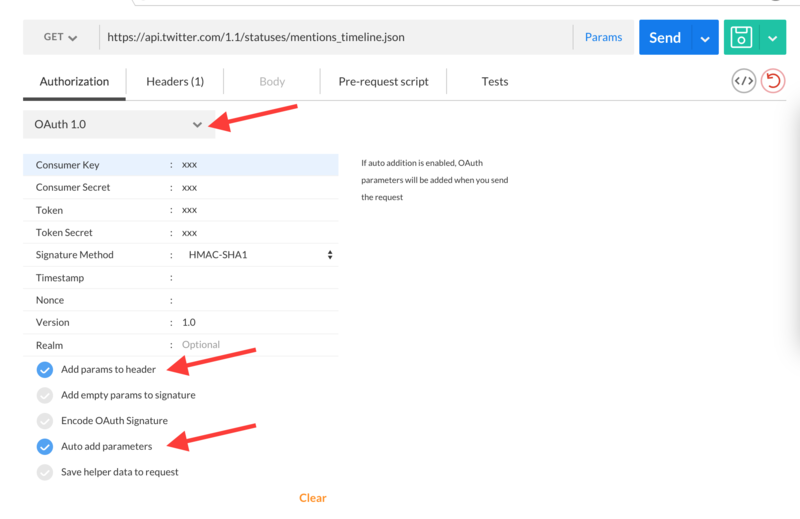 The add authorization data has been moved to the left column and requires you to select the drop down menu to change it to "Request Headers". If anyone reaches this in 2017, my problem was the nonce too but the one with length 32 didn't work for me. I checked the tutorial and used the one posted there and it started working. 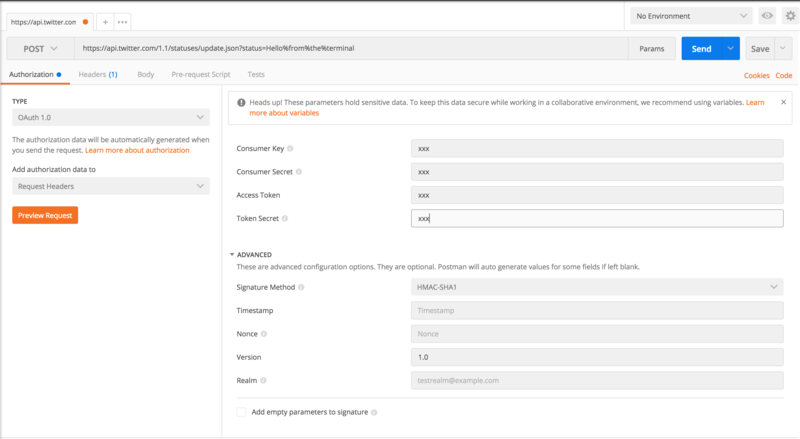 Make sure you choose postman to add the authorization data to the headers and not the body. For me, Postman created 11 character Nonce. I got the correct Twitter API response with the 11 character Nonce. Apart from the authentication settings that are taken from twitter developer console, when searching q=target_user_id it worked as opposed from q=@target_user_id, where I got the error 32, could not authenticate you. So, after numerous attempts, what made a difference was just removing the "@" symbol from the q parameter value. Not the answer you're looking for? Browse other questions tagged twitter postman or ask your own question. Twitter OAuth API how to post to someone else's twitter? 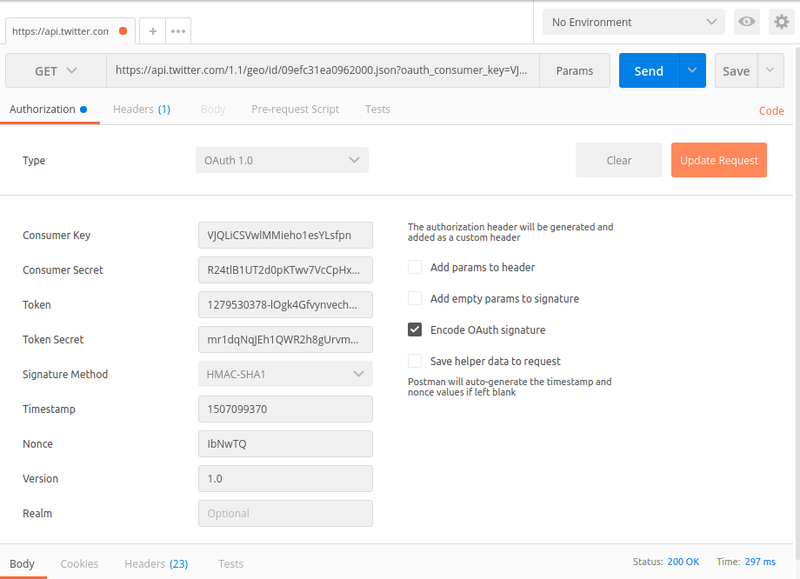 How to use POSTMAN rest client with magento REST api with Oauth. How to get Token and Token Secret?